The DeWalt track saw lets you easily make perfectly straight cuts and bevels, its dust collection is excellent, and you can even attach tracks together for longer cuts. Most people think of just two options: a table saw and a circular saw. But there’s a third option that we rarely consider: the track saw. I’m in the same boat as everyone else, although I’m not sure why. Perhaps it’s because there just aren’t many options from which to choose, but that’s really a chicken-or-the-egg question. Maybe the marketplace just hasn’t demanded them. Yet the track saw is an elegant and nearly foolproof alternative to the size and outfeed challenges of a table saw and the relatively imprecise and wobbly lines of a circular saw. By clamping a track to the work surface, you can guarantee near-perfect cuts. But how do you score style and usability points with this already solid idea? Well, if you’re DeWalt, you combine it with your FlexVolt battery platform. Although seeing a track saw on the job is a little like seeing a Northern Hairy-Nosed Wombat in the wild, DeWalt’s corded version has been around for over a decade. You won’t find any material differences between the corded version and the FlexVolt apart from the battery. Like the FlexVolt Miter Saw, DeWalt started with an established foundation and converted the power source. The DeWalt FlexVolt 60V Max Track Saw uses the 60V capacity of the battery pack which powers a brushless motor. A variable speed dial selects between no load RPMs of 1,750 and 4,000 to make cuts up to 2-1/8-inch thick. It bevels to 47° and has a cutting depth of 1-5/8-inch at 45°. One minor complaint here is that there’s no 45° stop. It may take a few tries to get acclimated to the straight plunge mechanism which you push instead of pull down as you might have done with other plunge or track saws. You’ll notice that the blade is almost completely enclosed in a metal shroud in contrast to the tool body and blade guard of a typical circular saw. The benefit is two-fold: less exposed blade is certainly safer and DeWalt claims the shroud allows a 90% dust extraction capability when attached to a dust collector. This will be especially helpful to carpenters working in a finished space. Simply remove the shroud to change the blade. You’ll also notice the riving knife plunges down with the blade. Of course, the namesake feature that gives the user the ability to make such straight, clean cuts is the dual-edged track. The saw can sit on the track in both orientations which allows for cuts in both directions. Tracks come in 46-, 59-, and 102-inch lengths and what’s even better is that you can connect the tracks for longer cuts. Once the track’s raised rails are aligned with saw’s grooves, an easy turn of the continuous anti-kickback mechanism dial keeps prevents the saw from deviating from the cutline. Track clamps slide into the underside of the track and their rubberized pads press against the bottom of the work surface, securing the two together. The clamps can run along the entire length of the track so you can clamp very short pieces all the way to the length of the track (or combined tracks). At first, it’s easy to visualize only cross and rip cuts perpendicular or parallel to the material’s edge. But it’s important to note that the track can be clamped to any cutline angle across the plane – and it can bevel along the same line, too. In this way, it’s more versatile than a table saw whose fence can only parallel to the blade. You could certainly use a miter gauge but you can imagine that would be more cumbersome than the track guiding the blade down a long cut. Once the anti-kickback dial is engaged, you know the cut is going to be right on the money. It’s awesome. It’s incredibly accurate compared to any regular circular saw and more functional than having a table saw in many cases. For instance, if you’re ripping down face frames on a cabinet or the bottom of a door, you won’t be able to beat the clean, accurate cut of the DeWalt FlexVolt 60V Max Track Saw. I don’t think I’ve ever seen plunge action like the one on this track saw. That doesn’t mean it’s bad by any means – it’s just a little different feel. 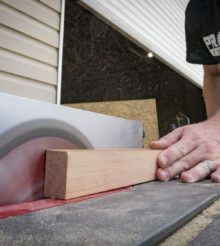 Those familiar with the handful of track saws on the market or even plunge saws will naturally want to pull the saw down – or maybe a better example would be a miter saw’s action. But you actually push the DeWalt down to plunge. There’s a lockout to prevent plunging, too. This saw would be perfect for putting a straight edge a deck or flooring. I’ve used it on several jobs but most notably on the house I’m building for my family. It’s been a long process to maintain and grow my business while working on the new digs but it’s certainly a labor of love. Any contractor who has done it knows that pulling double duty isn’t easy. But what is easy are compound miters with the DeWalt FlexVolt 60V Max Track Saw. I had a skirt board that was running along the wall of the staircase (at the angle of the staircase, of course). At the corner where the wall terminated, I marked the board, took it off the wall, and then clamped the track saw to it to make a perfect compound miter. This is the easiest, cleanest, and fastest way I’ve ever done a cut like it. It turned out beautifully. The dust collection system works as advertised with the vast majority of sawdust captured in the vacuum. As I mentioned, this is especially important when working in a completed or near completed workspace. Covering everything with dust again will just take more time (and money) to clean up. And who wants to breathe all those particles. The dust port swivels to make it even easier to manage the hose or simply direct the dust away from you if you’re outside. The DeWalt FlexVolt 60V Max Track Saw is just what the carpenter ordered for precise and clean rip, cross, and bevel cuts. It’s especially helpful for inside work because the dust collection system works so well. Cutting with a circular saw or table saw reveals any little hiccup or shake in the line. But with the track clamped securely to the work, you’d be hard-pressed to make anything but a perfectly straight cut with this saw. The interesting plunge action is probably unlike any saw you’ve used, but you’ll get used to it quickly. Never during this review did I wish there was something different about this saw. It’s the right solution to one of the main challenges contractors have always had – making a perfectly straight cut. You can buy the saw bare (and without a track) for $379 but you can get a battery and 59-inch track for $579. That comes in about $150 less than Festool’s comparable kit. Makita has a new plunge cut saw that’s $499 without a track. In any event, I know that at least the DeWalt is worth the cost of adding alongside a circular saw and table saw. I use it instead of those standard options at every opportunity. You should clean the spam, that aside is good that the track saw is taking off in this side of the pond. In europe a worm drive is inexistent (better not to talk about a left blade saw).